I think I have found the best methodology for me for sewing Winding Ways blocks: pin, pin, pin! I tried my Curve Master foot which I have used with success in the past and I tried a couple of pin-less methods as described on You Tube, but I have decided I get the fastest progress and most accurate seams by simply pinning a lot! You gotta do what you gotta do! And I used a quarter inch foot. 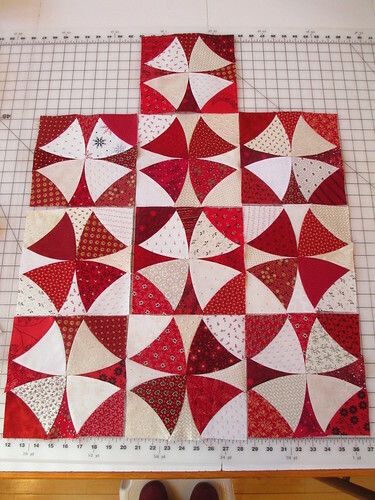 I am loving how the secondary interlocking circle design is becoming apparent now that I have a few blocks completed. I love this quilt. It’s on my lifetime list of quilts I want to make. I think I’ll borrow someone’s accuquilt cutter to cut the pieces though. Or maybe try inklingo. Your squares are looking great! I really recommend the Accuquilt for this cutting task. I visited your blog, too. Whatever method you are using IT IS WORKING WONDERFULLY…….Looks GREAT ! ! !